This unit is constructed of solid oak and oak veneers and provides a convenient 4 person workstation that maximizes space. The apron comes with 4 locking drawers and 4 GFI protected AC duplex receptacles. 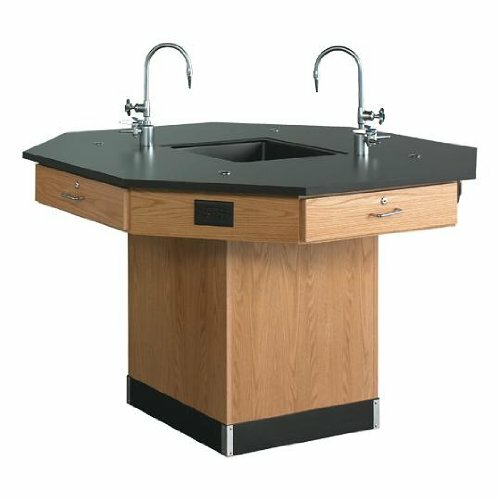 Accessories include 2 combination water/gas fixtures, 4 rod sockets and a 16" width by 16" depth by 7" height epoxy sink with strainer, stopper and trap. Easily accessible to the utilities. The top is 3/4" black phenolic resin. Drawer inside dimensions: 18" width by 11" depth by 3-1/2" height. Measures 56" width by 36" height by 56" depth.